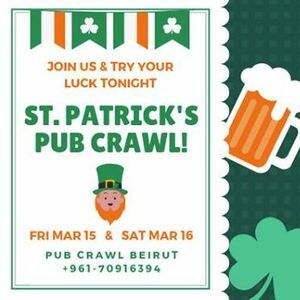 Join our pub crawl this Friday and Saturday and try your luck!! We will start at 8:30 pm at the intersection of Gouraud, Armenia and Pasteur Streets in Beirut facing Doculand (check map). At 8:45 pm, Pub #1: Discounted drinks up to 50% off, Free shots. At 9:45 pm, Pub #2: Discounted drinks up to 50% off, Free shots & Free Pizza and drinking games. 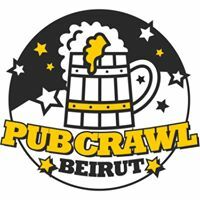 At 10:45 pm, Pub #3: Discounted drinks up to 50% off, Free shots. 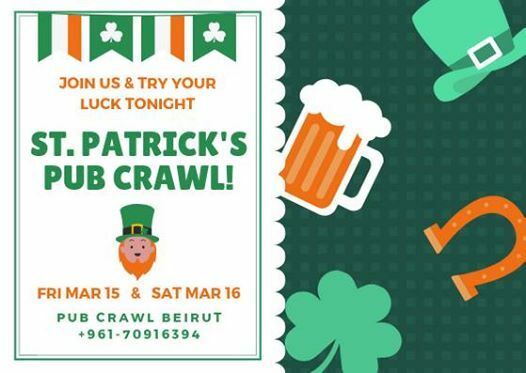 At 12:00 am, we head to one of the BEST clubs in Town where we will continue celebrating St Patrick's day.